The all-encompassing ban on smoking in public in Russia is the latest in a series of measures to protect the health of citizens. One of the most hotly debated topics in the Russian media and blogosphere over the last few days is the wide-reaching ban on smoking in public, which came into effect on June 1. It is now illegal to smoke in cafés and restaurants, hotels, marketplaces, long distance trains and railway stations. 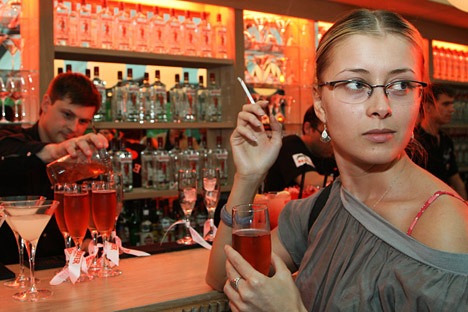 According to the new law, an owner of an establishment where a patron smokes will be fined up to 40,000 roubles ($1150). The law is harsher on corporate chains, which will have to pay up to 90,000 roubles (around $2,600). In other words, violating this law can bleed the commercial establishment dry. These rules go a step ahead from the ones India implemented on Gandhi Jayanthi in 2008, which banned smoking in all bars and restaurants, but allowed smoking in designated areas. Although a much smaller proportion of Indians smoke when compared to Russians, bars in places like Bangalore and Mumbai smelt like smokehouses before the ban. Once the ban took effect across India, it felt great to have a night out and not come back with clothes stinking of smoke. Before the latest ban, Russian restaurants and cafes did strictly maintain smoking and non-smoking sections but then the overall air in the establishment would have been polluted none the less. The smoking ban is the latest attempt by the Russian authorities to make public health a priority in the country. One of Vladimir Putin’s greatest legacies is his undying commitment to public health and fitness. Right from the time he became president, Putin has been promoting fitness and leading by example. Over the last fourteen years, Russia has gone from a has-been in world sport to a major power that won the maximum number of medals in the most recent Winter Olympics. Another great initiative by the regime has been a curfew on alcohol sales in shops. A year ago, one couldn’t buy any alcohol in a shop after 11 pm. Now that has been pushed ahead to 10 pm. The law enforcement authorities have also been called to take serious note of those consuming alcohol in public. Besides having a measurable effect on public health, cities in central Russia have become much safer over the last few years. The chance of getting accosted by a group of drunken hooligans in Moscow or St Petersburg, especially in the city centre, has dramatically reduced. The cigarette lobby along with some in the hospitality industry are trying to make a facetious claim that restaurants and pubs will lose a lot of money with patrons not choosing to go there on account of the smoking ban. I clearly remember a time when the no-smoking rule was not strictly implemented on many domestic flights in Russia. When airlines started forcefully started complying with the law, it didn’t stop smokers from taking flights. Now airlines in the country don’t serve alcohol on board domestic flights and that has helped greatly reduce trouble with drunken passengers. Again, many people like to have a drink on board a long-haul flight, but no boycotts are looming on the horizon. Friends of mine travelling with children to Goa wish chartered flights from Russia would also enforce bans on alcohol aboard flights. Smoking is a serious threat to public health in Russia. It is widely believed (and backed by a few surveys) that around 60 percent of men smoke in the country, to go along with 20 percent of women. The problem with smoking is that it not affects the smoker but even passive smokers, who are either in the company of the active smoker or just crossing paths. It’s a scientifically-established fast that passive smokers inhale more toxic smoke by default and are at a risk of getting lung cancer, respiratory and cardiovascular diseases. What could be worse for someone to get such a disease, despite not being addicted to cigarettes? Even before the new measures came into effect, earlier provisions of the anti-tobacco law helped bring down the number of smokers in Russia by around 16 percent, according to Health Ministry figures. The measures were put into place on July 1, 2013 included restrictions on smoking in workplaces, on trains and municipal transport as well as in schools, hospitals, cultural institutions and government buildings. The law also banned sponsorship by tobacco companies. The best way to further combat smoking along with the latest measures is to once again raise the taxes on cigarettes. This will also manage to bring in more revenue to the state.